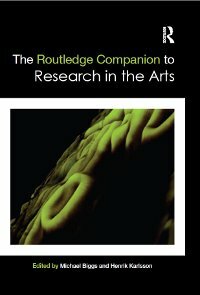 The Routledge Companion to Research in the Arts, edited by Michael Biggs and Henrik Karlsson, and to which I have contributed a chapter (co-written with Henrik Karlsson) is now available. The book is a collection of writings "on research in the creative and performing arts by leading authorities from around the world." The practice-led PhD, which began in the U.K., is now ubiquitous in several parts of the world. As the doctorate becomes more settled in university life, it becomes increasingly important to reach a balanced understanding of its basic concepts, methods, and outcomes. What is artistic research? How does art create new knowledge? How can a PhD-level art exhibition be assessed for quality? This book is the first comprehensive look at concepts such as research, knowledge, creativity, the visual, experiment, quality, and assessment, as they are used in practice-based programmes influenced by the U.K. and E.U. models of higher education. Now that art is being taught in universities at the doctoral level, it may spur a fundamental rethinking of the university’s basic concepts of professionalism, community, and purpose. For that reason this book is also an irreplaceable resource for those interested in the coherence and idea of the university as a whole.